Brighten your bedroom and add a contemporary style with this dresser mirror. The mirror features a large square mirror surface that reflects light and makes prepping for your day a breeze. 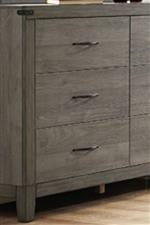 The 2042 Contemporary Dresser Mirror by Homelegance at Gallery Furniture in the Oregon, Portland, Clackamas, Washington, Beaverton, Northwest, Vancouver area. Product availability may vary. Contact us for the most current availability on this product.